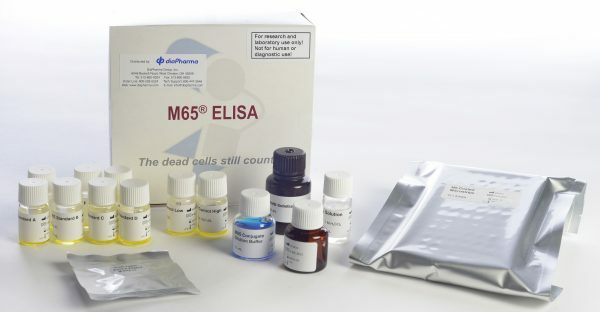 The M65® ELISA measures soluble keratin 18 (K18) (cytokeratin 18 [CK18]) released from dying cells and can be used in the research of overall cell death (due to apoptosis and necrosis) of epithelial cells. The M65® ELISA can be used together with the M30 Apoptosense® assay in research. As both assays are calibrated against the identical reference the combination of M30 Apoptosense® and M65® ELISA should allow for research determination of the relative contribution of apoptosis to the total degree of cancer cell death. M65 Coated Microstrips: One microplate, 12 strips with 8 wells each, 96 dry wells in total. The wells are coated with mouse monoclonal K18 antibody M6. The microplate is sealed in an aluminium bag, which contains a desiccating device. If not all the strips are used, reseal the bag and keep the desiccating device inside. Ready for use! M65 HRP Conjugate: Concentrate (24 × conc). One vial containing 0.4 mL of mouse monoclonal M5 antibody (anti-K18) conjugated with horseradish peroxidase (HRP) in a phosphate buffer with protein stabilizers. Preservative added. Should be diluted with M65 Conjugate Dilution Buffer. Note! Do not expose to light! M65 Conjugate Dilution Buffer: One vial containing 12 mL of phosphate buffer with protein stabilizers for dilution of the M65 HRP Conjugate. Preservative added. Blue coloured. Ready for use! M65 Standard A–G: Standard A containing 4 mL of phosphate buffer with fetal calf serum (FCS). Standard B–G, 0.5 mL each, containing standard material in phosphate buffer with FCS. The values of Standard A–G are 0, 125, 250, 500, 750, 1 200 and 2 000 U/L, respectively. Preservative added. Yellow colored. Ready for use! Serum/plasma samples > 2 000 U/L can be diluted 1 + 1 with Standard A, but dilution with pooled human serum is recommended (see section “Performance Characteristics”). M65 Control Low & High: Two vials containing 0.5 mL of reactive components in phosphate buffer with FCS. 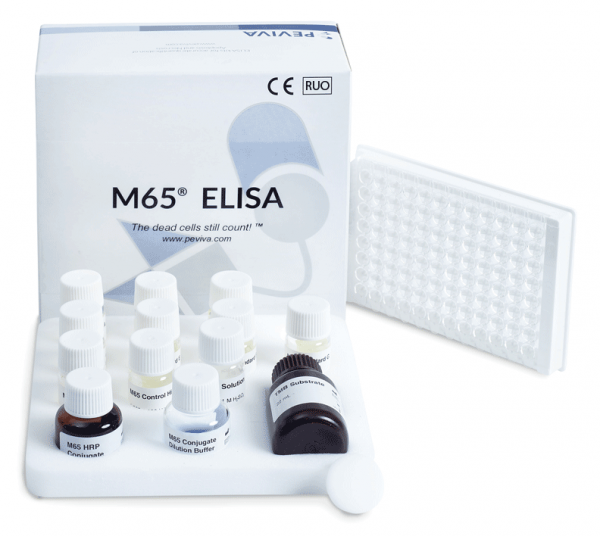 The values of M65 Control Low and High are stated on the respective vials. Preservative added. Yellow colored. Ready for use! Wash Solution: One vial containing 50 mL of concentrated (10 × conc) Wash Solution. Dilute with 450 mL of fresh deionised water before use. Phosphate buffer with Tween® 20. Preservative added. The M65® ELISA is a solid-phase sandwich enzyme immunoassay. Standards, controls and samples react with a solid phase capture antibody M6 directed against K18 and the HRP (horseradish peroxidase) conjugated M5 antibody directed against a different epitope of K18. Unbound conjugate is removed by a washing step. TMB substrate is added. The color development is stopped and the absorbance is read. The resulting color is directly proportional to the concentration of the analyte. By plotting a standard curve from known concentrations versus measured absorbance, the amount of antigen in the sample can be calculated. The concentration of the antigen is expressed as units per liter (U/L). Note: Please contact us at info@diapharma.com if validating the ELISA with spiking and dilutability studies. Spiking experiments – We recommend not to spike with the standard included in the kit. For spiking experiments, please inquire about a special spiking sample. Dilution with Standard A – For the dilution of human blood samples, we recommend dilution of the samples above the standard curve with pooled human serum. CK18 is an intracellular protein expressed at high levels by many types of epithelial cells. Most CK18 molecules will form insoluble filaments in the cell, but a pool of soluble CK18 can also be demonstrated. During cell death, the cellular content of CK18 will be released into the extracellular compartment. Research measurements of extracellular soluble CK18 will therefore reflect epithelial cell death “by any cause” (due to apoptosis and necrosis). CK18 is cleaved by caspases during apoptosis, and caspase-cleaved fragments will be released to the extracellular compartment. The relative proportion of extracellular caspase-cleaved CK18 (ccKC18) compared to total CK18 will therefore reflect the relative proportion of apoptosis to total cell death research (different “M30:M65 ratios”). The M65® ELISA uses two anti-CK18 mouse monoclonal antibodies of the IgG type and is primarily intended to be used together with the M30 Apoptosense® assay for assessment of research in tumor cell death using human serum samples. 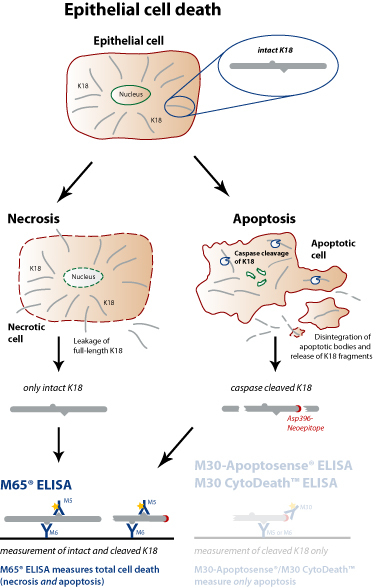 M30 Apoptosense® ELISA specifically measures a neo-epitope formed by caspase-cleavage of CK18 at Asp396 (CK18Asp396-NE M30 neo-epitope) and will reflect apoptosis of epithelial cells. The units of the two assays have been calibrated against the identical standard material to allow the calculation of a ratio between caspase-cleaved and total CK18 (“M30:M65 ratio”). Induction of apoptosis in cultured cells will result in release of caspase-cleaved CK18 and in relatively high M30:M65 ratios, whereas induction of necrosis will almost exclusively result in release of CK18 molecules that are not caspase-cleaved and in a low M30:M65 ratio. The M30:M65 ratio will therefore reflect the mode of cell death of epithelial cells.